The short story collection “Days of Awe” is the long awaited new publication from New York based author A.M. Homes, who has already found international appeal with her previous work “The Safety of Objects” (1990) and “Music for Torching” (1999). Meanwhile working for TV and print magazines, she hasn’t published in book format since 2012. A.M. Homes is known for her sharp sense of analyses of human interaction and uneasy lives with an array of characters that fail to become what they set out to be. Most of the 12 short stories of “Days of Awe” are masterclasses in small alterations. A singular glance can bring a futile situation to the point of explosion, not being sure if it will end in tragedy or redemption. Both outcomes would be welcome as the possibility that nothing will change is always the most heart-breaking one. 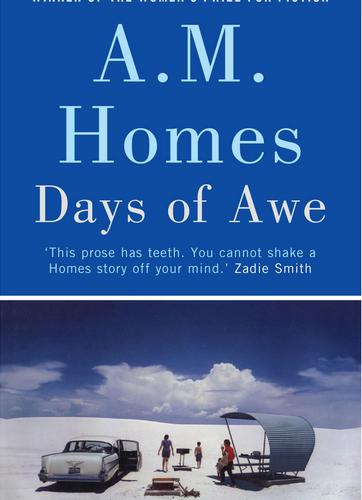 Homes sharp observations work best in the title story “Days of Awe” – an affair set at a Genocide conference -, “Brother on Sunday” – a childish rivalry between two brothers played out on the beach – and “The Last Good time” describing a nostalgic escape to Disneyland. The stories are different in style, so you might not like them all. But they will always question your thinking and leave you a little bit less self-assured than before.